Rice: ubiquitous in all Chinese households and Chinese restaurants, no meal can do without this starchy staple. 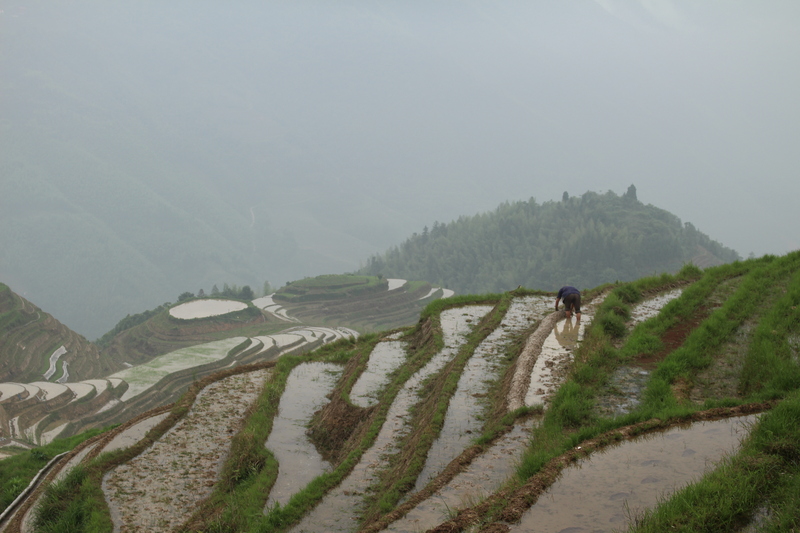 As such, our trip to China wouldn’t be complete without getting up close and personal with rice paddies. 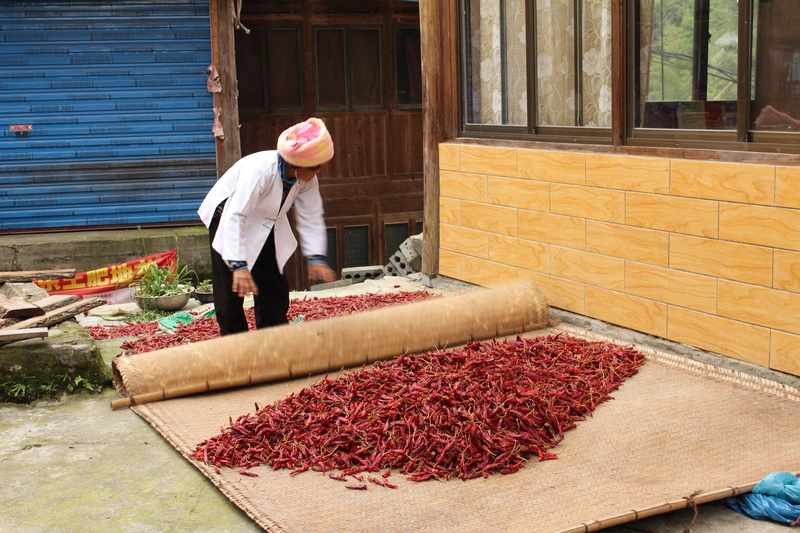 Just a short two hour bus ride from the city of Guilin, we arrived in the county of Longsheng, which is home to the famous Longji Rice Terraces as well as some of China’s unique ethnic minorities. 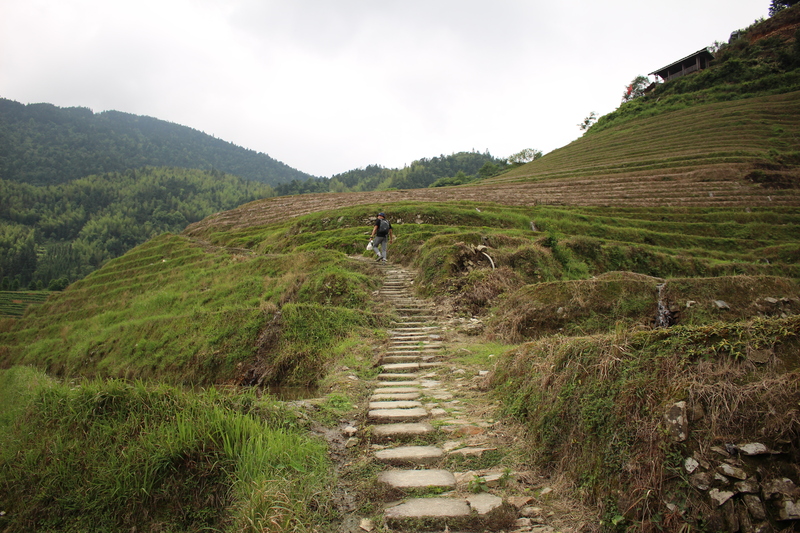 The rice terraces span over several small farming villages making it a perfect trip for an outdoor enthusiast, for you could spend multiple days hiking from village to village. 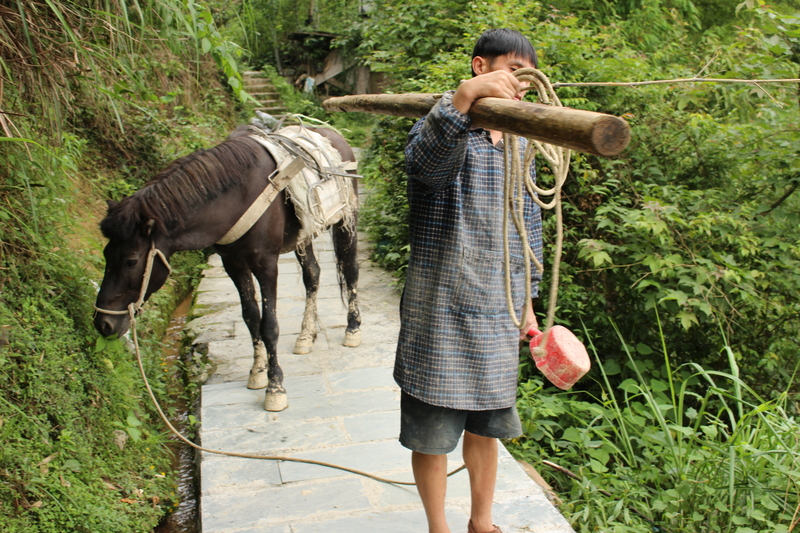 Simon and I found that leisurely exploring just one village was enough for us to appreciate the countryside beauty. 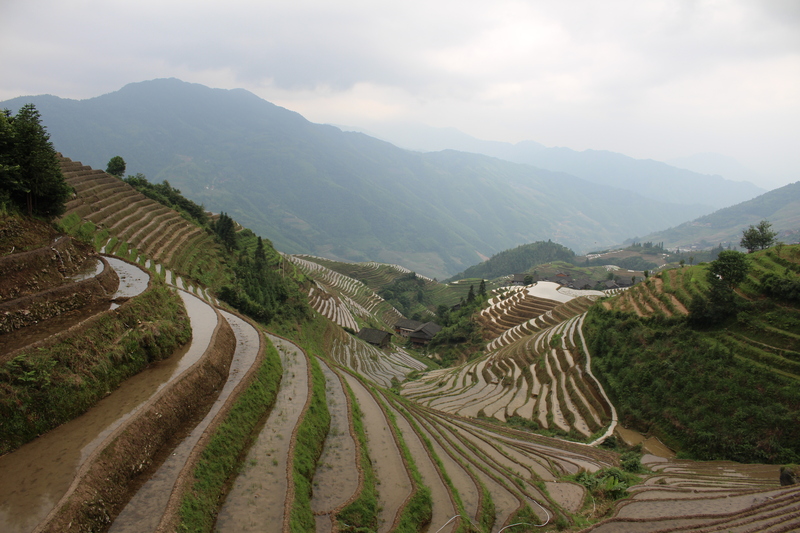 Ideally, the rice terraces are most beautiful when filled with water, for they provide a mirror like reflection of the sky if conditions are clear. 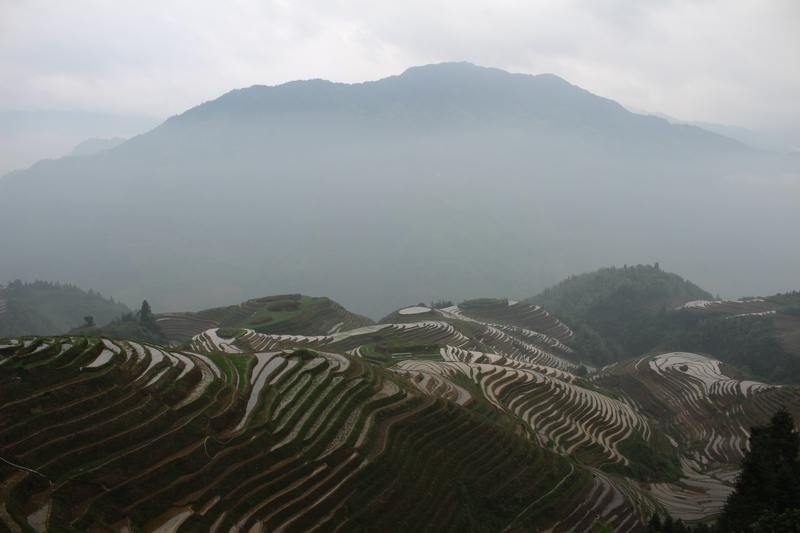 We explored the village of Ping An, and although the skies were hazy during our time there, at least their endless terraces were brimming with water. 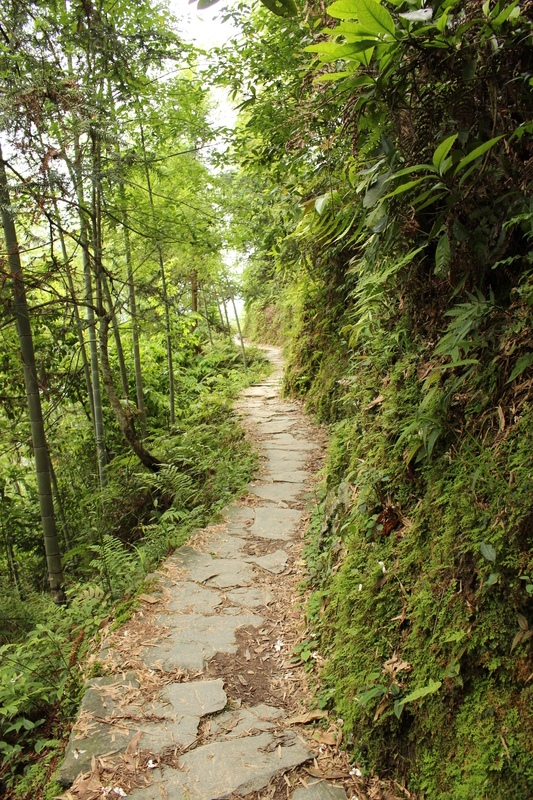 We trekked through Ping An for the whole afternoon, sweating under the humidity and from carefully balancing on the narrow uneven steps that weaved through the terraces. 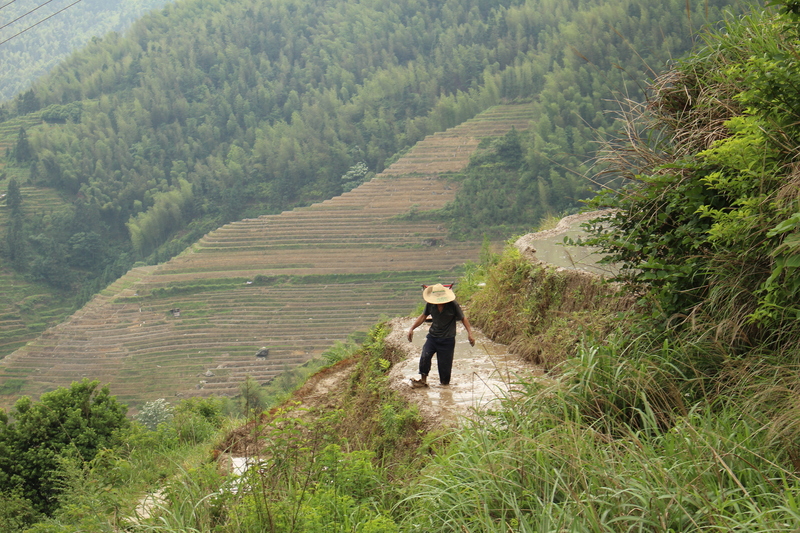 Any misstep would mean soaked muddy clothes from falling into the paddy, and we certainly wanted to avoid that. Removed from the busy city life, we were completely enveloped by the countryside, surrounded by the sounds of water running gently from the irrigation system and mud squishing under our shoes. 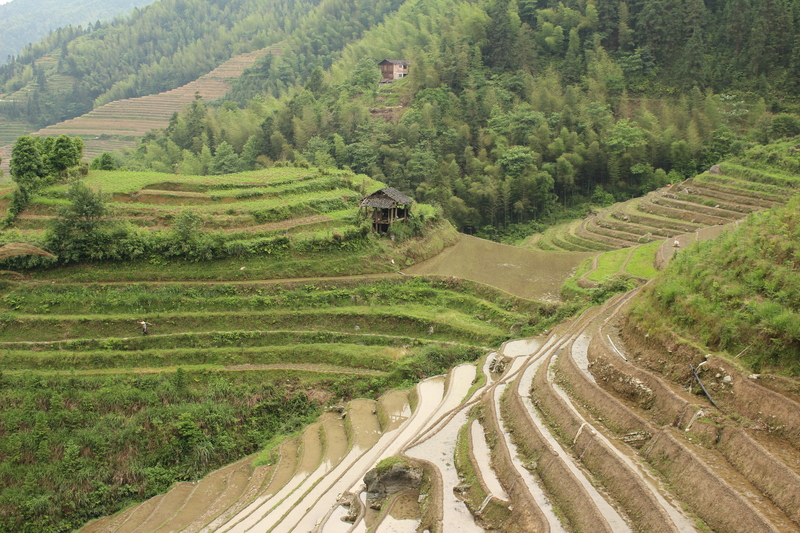 The rice terraces stretched on as far as the eye could see: high up to the sky, down low to the valleys, on hills near, and on hills far far away. As daylight drew to a close, we booked two beds for the night. The creaky wooden hostel seemed dead and damp, but as did the entire village and all of the other hotels and hostels we visited. It felt like were were the only guests at the hostel, but nevertheless, we enjoyed a delicious dinner in their empty dining area. We feasted on specialty local dishes consisting of free range chicken roasted on a bamboo, and sticky rice cooked inside bamboo. Although it was still early, we retired to our bunk beds, for we had an early start the next morning if we were to catch the sunrise. I had an unrestful sleep on the top bunk, face to face with the ceiling. Every time the guests on the floor above me moved about in their room, the floorboards groaned and creaked right in front of my face, as if it would cave in on top of me. Just when it felt like I was about to drift off into unconscious bliss, the blaring alarm coming from the room next door jolted me awake, followed by beams of light shining through the wooden slats. It was 5:30 am and we were hiking in semi darkness as the night sky was slowly giving way to a soft glow of the impending sunrise. Although the village was somewhat empty during the daytime, it was even more eerily desolate this early in the morning. There wasn’t a human soul in sight. Hotel lobbies and restaurants with their doors closed and lights off looked like they were vacant for years. Vendor stands were almost unrecognizable when devoid of souvenirs and colorful crafts for sale. The only sounds that filled the silence in the valley came from the echoing of roosters cockle doodle doing, a low humdrum of buzzing from insects, and a new sound we hadn’t heard in the daytime: the lullaby of frogs continuously ribbiting. 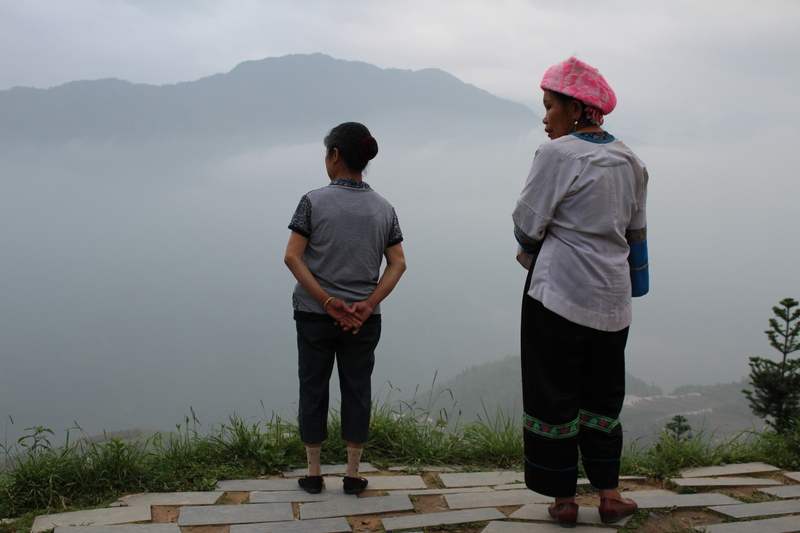 It was a beautiful resonant sound that was mystified by the early morning mist and humidity that hovered close to valley and rice terraces. Surprisingly, there were but just a few tourists at the viewing platform when we got there. Breathless from the climb, we took a seat on the steps and eagerly waited. We watched sunlight slowly appear as a soft glow behind the clouds, that eventually disappeared as more clouds rolled in. We soon realized that we wouldn’t be able to witness the legendary sunrise that we read so much about. The overcast conditions were just not right for such a sight. Simon and I stayed there for almost two hours, hoping that by some miracle that the mirrored reflection of the sky would reveal itself. Alas, it never did. Moments like these remind me that the journey itself is more important than the destination. Sunrises aren’t always going to be perfectly beautiful, views may be marred by unsightly construction, or perhaps the sight doesn’t live up to how you imagined it. Simon and I did not witness the postcard pretty sunrise that we pinned our hopes and dreams on, and it is likely that we will never get the chance to return there again. 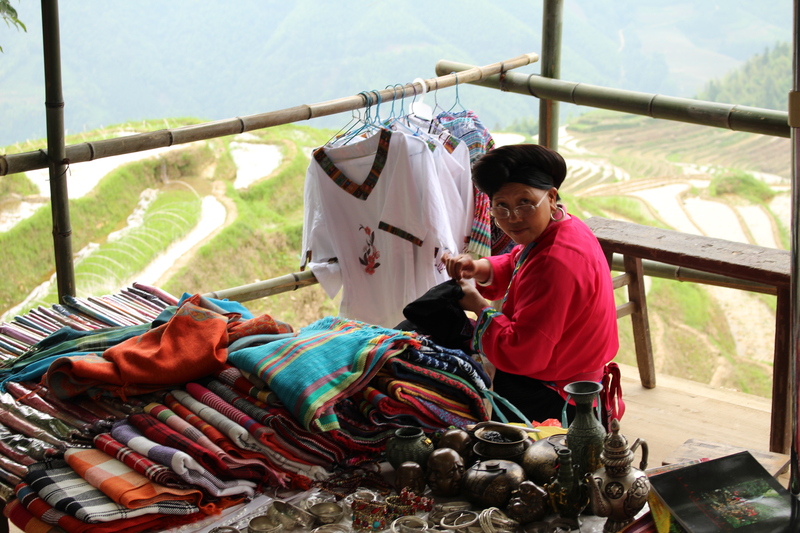 Yet we did not leave the Longji Rice Terraces disappointed. I have no pictures to show for it, nor can words quite accurately describe it, but meandering through the rice terraces in the quiet darkness before sunrise is an experience I will never forget. You’re right, the view is absolutely stunning and so worth it!